One of the venerable programs for working with webpages using Microsoft software is the program named FrontPage. The program lets you publish using HTTP or FTP, but in order to publish with HTTP, it required that extensions be installed on the server account. 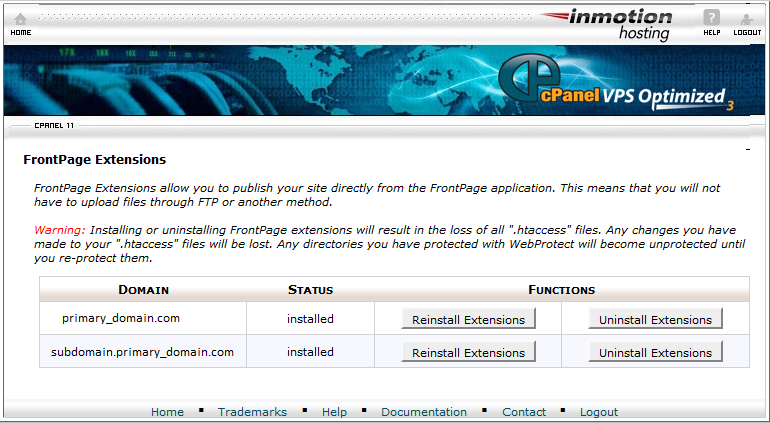 cPanel accounts can be set to have the extension loaded or removed using the cPanel interface. As time has passed, the need for FrontPage extensions has also faded and in some cases may need to be removed from the installation. Removing the HTTP extensions still leaves the option of publishing with FTP. 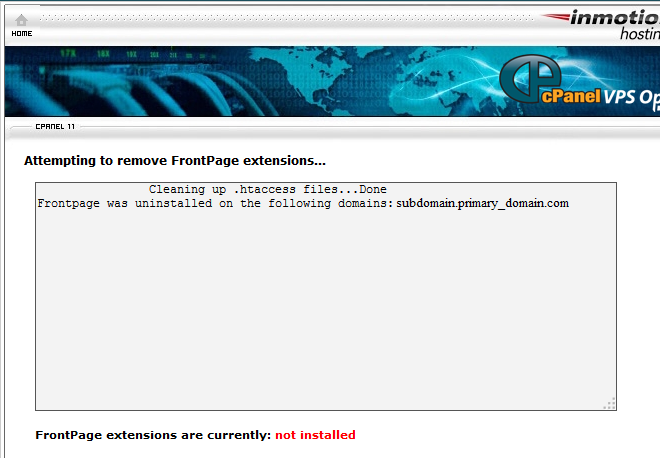 The following article explains how quickly remove these extensions using the cPanel interface. Scroll down to the ADVANCED section of the Cpanel. Click on the FrontPage Extennsions icon that you see there. When the screen loads, you will see the websites that have the FrontPage Extensions loaded. There will be an option to REINSTALL EXTENSIONS or UNINSTALL EXTENSIONS. To remove the extension, simply click on the UNINSTALL EXTENSIONS button next to the domain name that you wish to clear. Click on the GO BACK button at the bottom of the screen when the uninstall process has finished. You will see the same list of the website(s) on your account, but this time with option to INSTALL EXTENSIONS and CLEANUP OLD EXTENSIONS. The cleanup of the old extensions is not required, but in some cases when you are having problems with the extensions and you are attempting correct issues, then cleaning up the old extension may be your best course of action. This completes the process to remove the FrontPage Extensions. If you need more information on FrontPage extensions, please check out the article How do I install Frontpage extensions in my control panel (cpanel)? Let us know a valid way to kill/maim or otherwise destroy all the frontpage extensions on our sites.